I missed your session (getting ready for my talk) but this year's conference seemed less unbalanced gender wise than previous years. Our field is supposed to be a meritocracy, anything else is foolish. Yes, I don't know if I was imagining it, but I felt like there were more women there than last year. Thanks Derek! Maybe I'll re-run the session somewhere near you one day? You should see if you can use the No Fluff Just Stuff conference in Seattle next year as an excuse to get up this way. I've always thought it was a great conference, and I'm hoping to go next year. 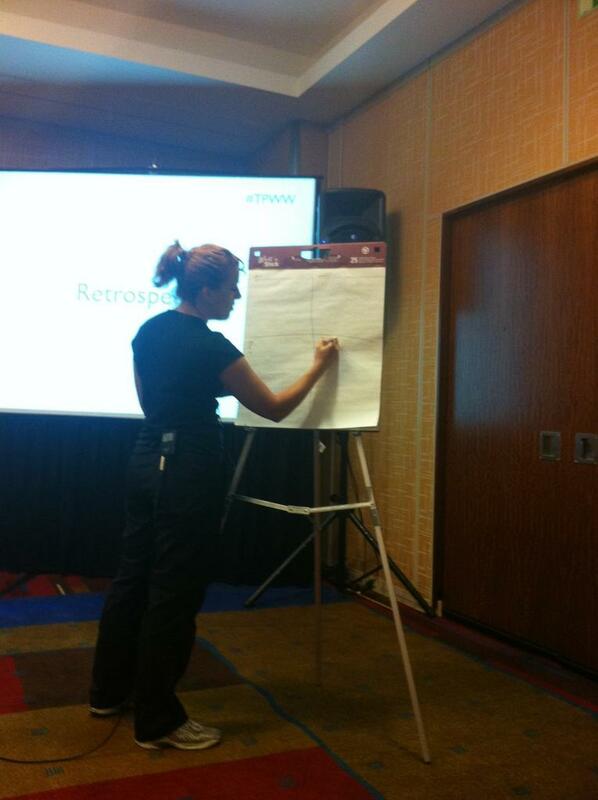 You did a great job at Javaone - maybe next year you can be the one in the Community keynote! That looks very interesting, thank you! thanks trish, great info. sounds like different women subject / Role in IT. Sorry I missed your presentation at JavaOne. I'll make sure to get the recap from Georges. It may take a generation, but this is an imbalance that can be changed -- for the better. Did you see the National Geographic presentation (part of the JavaOne keynote)? We've got to find ways to get kids (all genders, all backgrounds) interested in science, math and technology while they're still kids, and the best way to do that is *not* to sell science, math and technology, but to expose them to scientists, mathematicians and technologists who love what they do. I think programming is a great field to go into, for men and women, and we need to find ways to show that to the next generation! Yes, I loved the way he presented that at the keynote! It's a really important message and I think it's much more powerful than trying to say "programming is fun" (even though it is!). Thanks Cameron, I appreciate the support. Try a broader outlook on the problem. Do you really think that gender imbalance only exists in IT, or does it exist in other fields of engineering too? You will probably find a large gender imbalance in petroleum engineering, too. Then the question becomes why are women turned off about engineering in general. If we are missing a lot of talent because women are not interested in IT, aren't we missing a lot of white-male talent in this field too because of the same factors that drive women away? My hunch is that women have less tolerance for the way that engineers of all types are treated in the corporate world. That is a much different and much harder problem to address than things like the "brogrammer" mentality. The lack of women in IT may be a red-herring to avoid facing up to the problem of management hostility to engineering in general. You're completely correct of course, it impacts engineering, in fact STEM roles, across the board. Personally I'm only going to try and tackle programming, because like any problem you have to take it a piece at a time. Sadly the session itself is not available on video, otherwise you'd see that the introduction sets up exactly the point you're making - talking about the missing women it IT is missing the point. As an industry we're probably missing out on talent from people of all backgrounds. We focus on the women because they're so visible. And I think it means we miss the point, that it's not that women don't like programming, it's that technology as a whole is not appealing to whole sections of society, and we need to work out why and tackle that problem. I find your idea interesting, it's not one I've heard floated before, and I think there's something in it. I am bummed I had to miss your talk for booth duty. I think we did a lot of things better this year, but IIRC there were only two women onstage during all the keynotes put together. That felt like a major fail. Yes, I noticed there weren't many non-white, non-male people in the keynotes. JavaOne was still better than most conferences for that, but there's still more that can be done I think. You can find the official attendance at your talk by logging on to the JavaOne speaker portal. They've posted preregistration numbers and actual badge scans, along with titles, location, and industry of each attendee. Looks like attendee feedback is in the process of being posted too. Right now there are links for my sessions but I can't see the results yet. Oh, and the session video is up now. It seems to have captured the slides and introductory part of the presentation, but I don't know how well the workshop portion came through. Oh great, thanks for that. I'll check everything out. This is excellent! Thank you for your wise argument and for getting it on the web. I really like your conclusion of "it becomes clear that we shouldn't be trying to work out the problems that face women, but instead be working harder to attract more awesome people into the job we love." As a woman just starting out in this field, the last thing I really want is to be reminded daily of how my gender makes me stick out. I appreciate the advice and support immensely. Thank you, I really appreciate the feedback! I'm glad it's helpful. Great article, Trisha. As an Oracle techie and presenter, I'm faced with many of the same challenges and questions you've posted here. I'm thrilled to see the Java community taking up the battle on their front, too! Thanks, it's good to know we're not alone!